All for the Lion shall victory sound! This is my new desktop backgroud, its totally aces!!! And yes, I stand ready to heed the call of the Lion. Edited by Grotsmasha, 24 April 2012 - 10:02 PM. WIP - Salamanders and other randomsIt's not more guns or tactics this army needs, it's Thunder Hammers, and lots of them! Most excellent! Is that Stobz's Rhino squad I see at the bottom there? Sadly no since this codex well straddle 5th and 6th editions. I,m not fond of being the RnD codex. Or I could weight and see. Edited by Grimdarkness, 25 April 2012 - 10:20 PM. So its for sure the codex is due in May. There is no solid rumors. I've hear several saying late may/early june and stickmonkey vehemently stating DA wouldn't see a book until after 6th ed is released. I have no doubts we'll see a codex before the 2014 but currently there is zero solid info one way or another. Currently we're looking at waiting around 5 weeks before we find out if some of the rumors are true/false. Unless Shadow Guard has his own inside source I'm thinking this was just made because it's cool looking. Edited by Droma, 25 April 2012 - 12:12 AM. It has his Inner Circle seal on it. So something must be up. 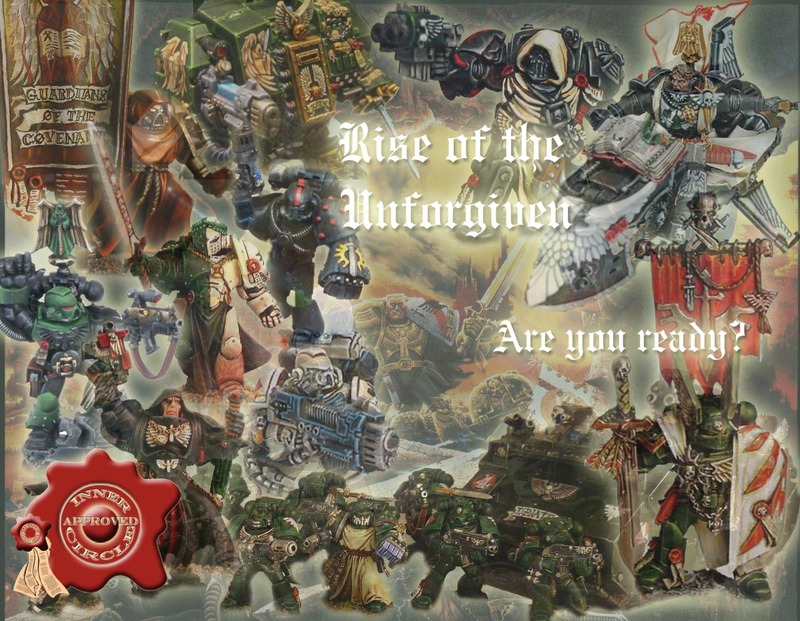 A believable rumor poster has stated on Warseer that Dark Angels will be one of three codexes released this year, one of the others being Chaos. His rumors have jibed with Hastings' and Harry's, so I am inclined to believe him. Mostly, anyway... I'll believe 3 codexes in one year when I see it. But I do think we'll be seeing a new C:DA soon. As for May? Tell me something I haven't heard yet, TSG! Pretty please? Here's to hoping for some badass conversion opportunities, gentleman. My FLGS guy got his call from GW today about ordering the May new releases. Necrons are getting new models. If anything is coming for us then it's the 2nd half of May. I think the May 17th releases are already set up, being more Finecast, so earliest seems to be June. i heard it was May 5th releases for the models. but whatever, im still ready to increase my army Please, Robed Terminators! 1. As a Wargamer I am not owned by one company alone. 3. As a Wargamer I am loyal to Excellence in miniature manufacturing. 4. As a Wargamer I am loyal to companies that are fair in pricing. 5. As a Wargamer I am loyal to companies that are accessible and provide me with timely information. 6. As a Wargamer I am loyal to companies that value me as a customer, not as a commodity. 7. In return these companies will receive my financial support. *Raises a sword from the shadows* "I stand ready, praise the Lion!" "Forward, brothers! For honour and Glory! For Terra! For the Emperor! Forward!" "I do not care who knows the truth now, tomorrow, or in ten thousand years. Loyalty is its own reward"
Very cool. There's my new desk top. Hats off to those whose models are featured. Edited by shabbadoo, 25 April 2012 - 10:19 AM. Now what makes you all think this has anything to do with a new Codex? Dagnabbit, I want to know what's going on!!! 6 more days and you will know. Aarrrgh, that's totally made it worse!! !